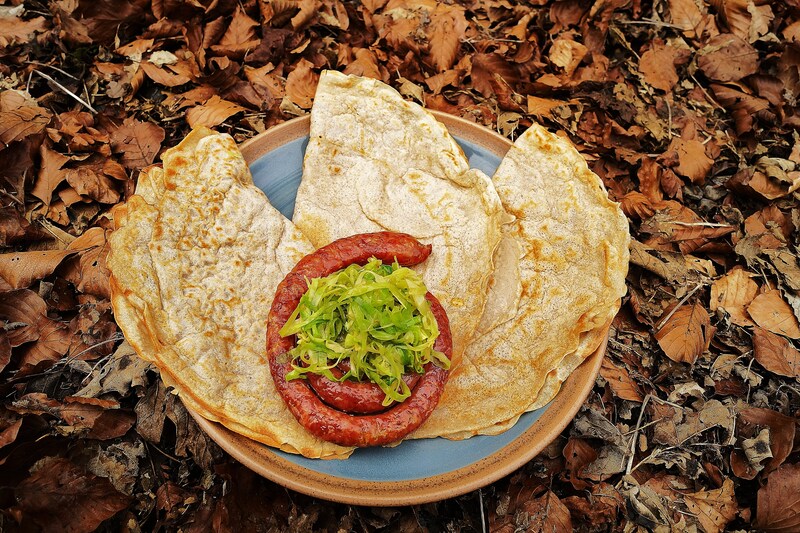 One thing is for sure; in Brittany people do not need an excuse to eat crêpes or pancakes. Whatever you want to call them, we actually call them Krampouezh so (pronounce “Krampooz”). 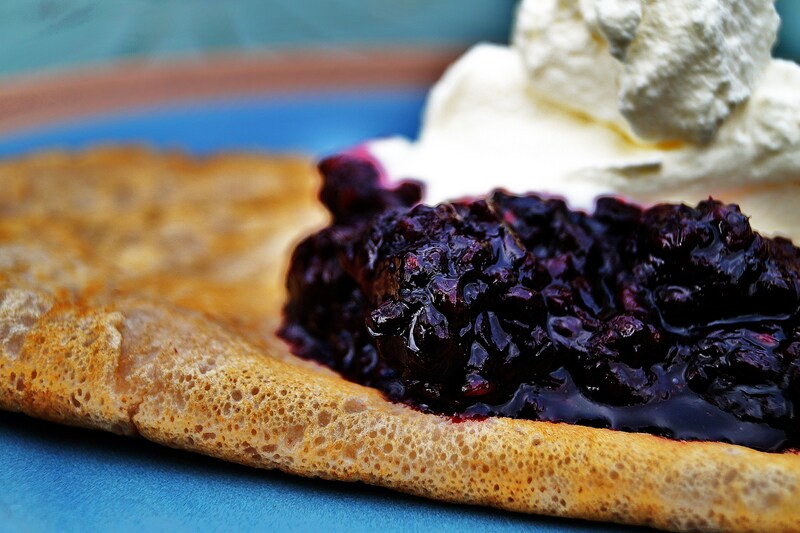 We have two types; the crêpes are for dessert and made with wheat flour, the “galettes” are savoury and made with the legendary buckwheat. It is easy enough to find Buckwheat flour if you check your local health food store. 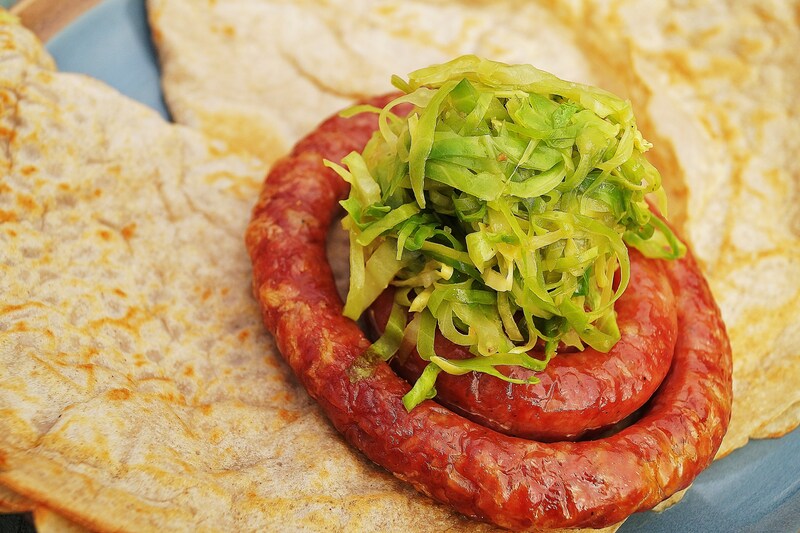 I have selected this recipe which is ideal for both sweet and savoury. The beautiful thing about buckwheat is that it doesn’t make any lumps while whisking. Take a large bowl for comfort, and put in the two flours together, the salt and baking soda. 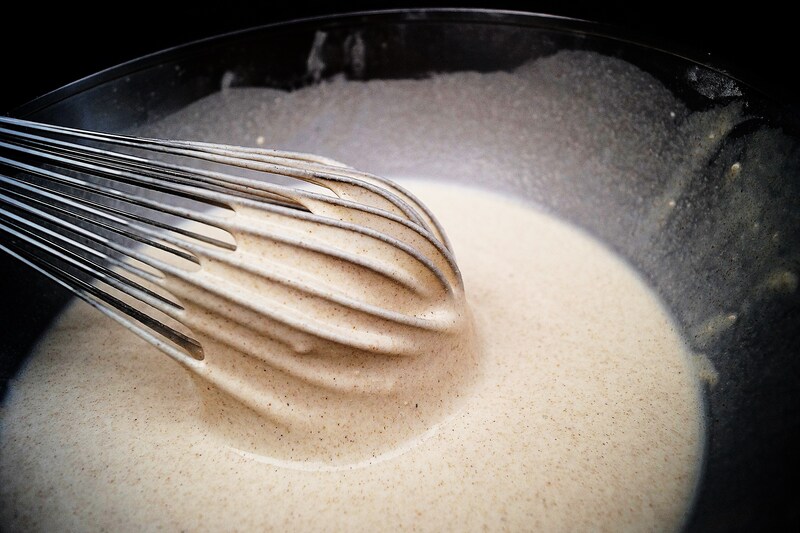 Give it a dry whisk to mix everything together. 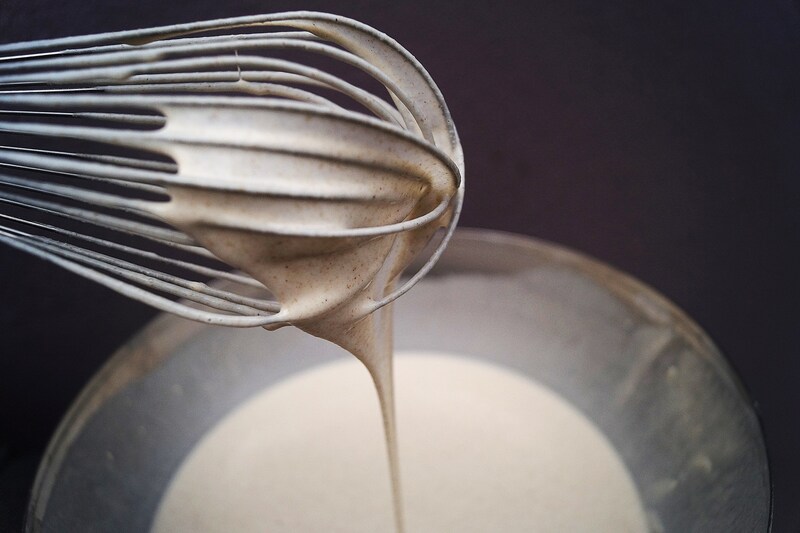 While whisking, add the milk and stir to a thick dough first, go on, show a bit of strength, you can do it! Keep whisking and add the rest of the milk, then the water. The secret now is to leave the dough or rather batter, to rest in the fridge for a few hours, ideally overnight. The making is a bit tedious but so worth it at the end. In a bowl, mix some melted butter and a mild oil. Roll an old piece of material into a ball and tie with a bit of string. This is just brilliant! Oil a hot pan, and start the process. Pour the batter in the hot pan, and tilt quickly the excess back in the bowl for thin crêpes, leave it for thicker ones. Almost ready when you see a nice brown marble forming, time to flip, are you up for it? Otherwise, use a plastic spatula. The topings are entirely up to you; this is the magic of crêpes. 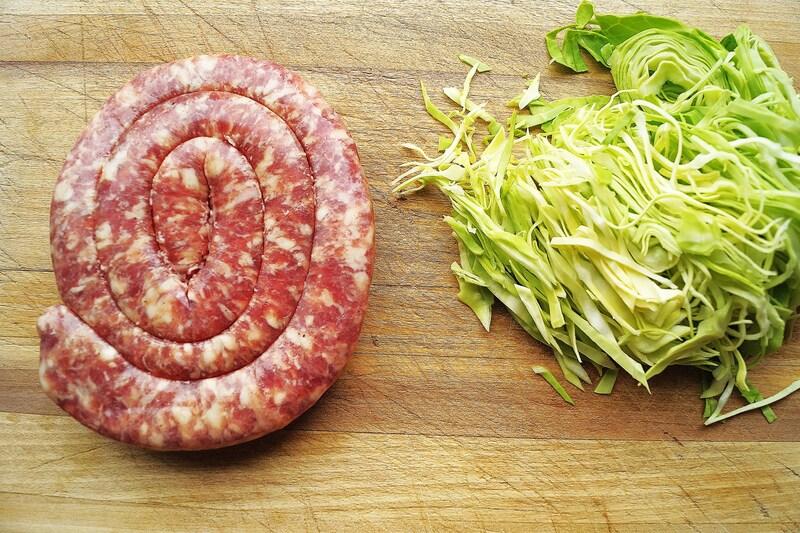 I used this time a roasted Italian salsiccia and thinly sliced sweet cabbage (come on, we are in Ireland after all!!!) that I braised in a good beef stock for a few minutes. A bit of butter before serving et voilá. For dessert, I had kept and froze some blackberries from the plentiful month of September 2014 that gave so generously. Stew them for a bit with a bit of water and sugar or honey, serve with a bit of whipped cream… Or, or, if you are feeling bold, you can always melt some 70% cocoa dark chocolate with a bit of butter or fresh cream, pour over the crêpe and put a DO NOT DISTURB sign on the door. Enjoy!